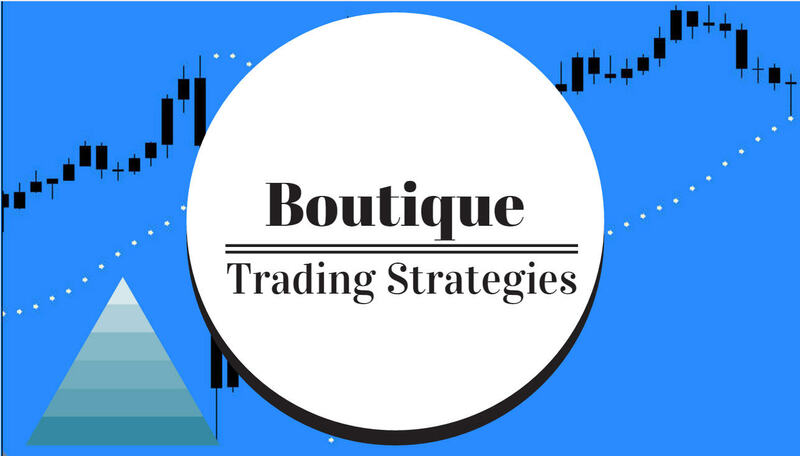 boutique trading strategies: Cash In On The Currency Wars Using ETF's ? Currency ETF's are becoming volatile as 'Currency Wars' expand. The US Dollar strength is impairing sales and profits for manufacturers. European politics is creating turmoil for the Euro and that will impact many currencies. We have tools and alternative tools to exploit fluctuations in currency ETF's. Let's have a look at this chart I have constructed using Relative Strength factor of a US Dollar Index ETF(UUP) and six ETF's which are used to make up the US Dollar Index. The six US Dollar Index component ETF's I have selected are Guggenheim FXF,FXB,FXC, FXC, FXY, FXS representing Swiss Franc, British Pound, Canadian Dollar, Japanese Yen, Euro, Swedish Krona. At some point the distances between these plots will start to narrow based on the actions of the various governments and markets and whatever manipulations may occur in order for different currencies to gain or lose advantages. We need only look at what has occurred in the past couple of weeks with the Swiss Franc, the Canadian Dollar and the Euro. 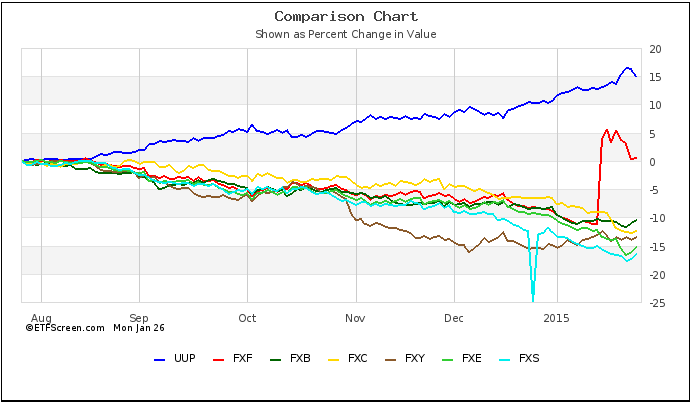 This next chart reflects the Relative Strength factor of the seven Etf''s that I am using, you can see that FXF, Swiss Franc, is outperforming the other component currency ETF's and that is based on the sharp move generated by Swiss government intervention a few days ago. How can we use this chart? Interestingly enough, each government involved as well as the EU is attempting to capture markets and they are going to do their best to manipulate their own currency and any other currency to their advantage. Volatility in currencies as well as stocks is being created daily with the manipulations. I gathered some information from Point and Figure charts at Stockcharts.com and am going to list the target prices for each of these currency ETF's. The numbers may surprise you. From those targets you can see huge differences from prices today, there will certainly be some activity as months pass. P&F targets are not guaranteed, I used them only as an illustration. What can we use to take advantage of these pending moves. There are many choices , however UUP and UUD may be quite suitable for most people as those represent long and short respectively. 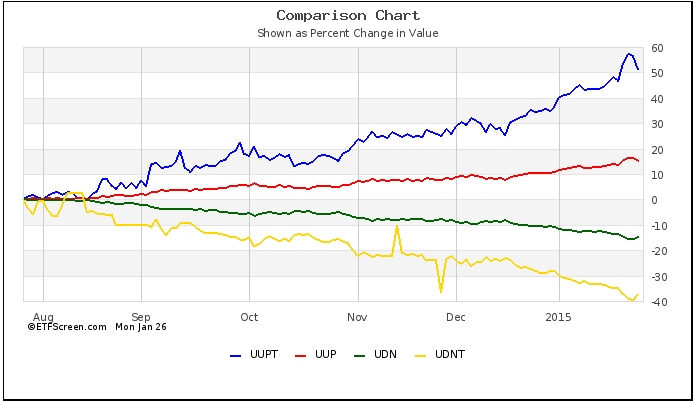 Some may favor using the PowerShares 3x Long UUPt or the PowerShares 3x Short UDNT. I have compared the four of these as follows. Using Relative Strength factor for comparison is most useful for trade selection and also trade management and may add another dimension to your trading system.